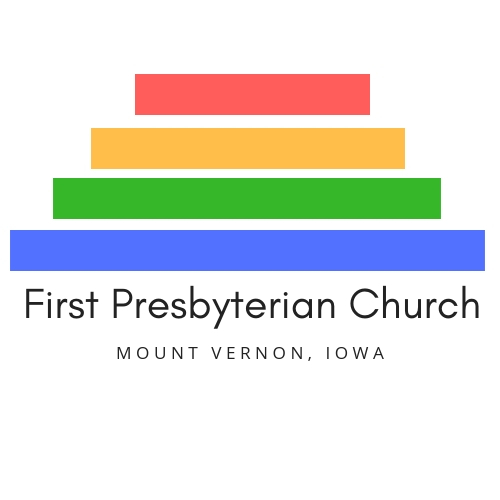 Presbyterianism came to Mount Vernon in 1843 when this community was beginning to take on the form of a village and Iowa was still a territory. In February of 1843, a group known as the New School Branch that met in rural homes asked to be recognized as a church. In 1847, another group known as the Reformed Branch became a recognized church. The third group known as the Old School Branch was meeting in the Bell Schoolhouse east of Lisbon. They became members of the Cedar Presbytery in 1854 and later moved to Mount Vernon. It was the merger of these three branches in 1870-1874 that formed the First Presbyterian Church USA. They worshipped in the church erected by the Old School Branch. The building still stands on east Main Street and is known as the Mount Vernon Rest Home. The church became independent of the Board of Missions, prospered and purchased a parsonage and grew in benevolence. For the next twenty years the church had full time ministers. One of the most noteworthy pastorates in the church was that of Andrew K. Knox. He began in 1894 and continued until his death in 1906. The plaque in the rear of the sanctuary commemorates his pastorate. During these years the present stone building was erected. The attendance had outgrown the wood structure, the membership being about 190. It was decided by the congregation that a new church was to be built on the north-west corner of Main Street and First Avenue. Stone for the church was from the quarry one-half mile away in the east end of town. It is said to be made out of the finest building stone in the state, Anamosa limestone. The cornerstone of the church was laid on September 5, 1895, and the dedication of the new building was on March 5, 1896. In 1911, the church received a fine pipe organ in memory of the William Armstrongs, former members. It came from their son who lived in Chicago. Later, in 1911, John Leigh, also a former member, willed a farm, the income from which would service the organ and create a music fund. These gifts have added much to the worship services of the congregation. The next era was an austere one, wartime and economic depression predominated. Many young ministers passed through the church at this time giving of themselves ably. Organizations within the church did their part as we came into better times. Benevolences increased and the women’s groups organized into the United Presbyterian Women. The Sunday School remained strong and well staffed. The Keedick Scholarship Fund was set up, and on-going gifts went to Camp Wyoming. A new manse was built, and the sanctuary and fellowship hall were remodeled. The Parish House, formerly the living quarters for the pastor, became the church office and Sunday School rooms. Our former pastor, Emory Gillespie, came to us in 1993. Church membership grew, along with its programs and ministries. In 2006, the congregation decided to embark on a building program. An architect drew up preliminary plans and a capital fund drive was completed. A new Christian Education and Administrative building will replace the Parish House. Presently, there are 210 members and many more “friends” of First Presbyterian Church. We are known for our creative worship services, excellent music program, and strong mission projects.